The government has introduced the concept of E Way Bill under GST, after abolishing the Border Commercial Tax Post to avoid tax evasion in India. In this guide we will explain you each and every aspect, rule and answer all the queries related to e-way bill system under GST in India. What is the meaning of E way bill? Under which section e way bill is required? What is the date from which e way bill has been made compulsory? What are the benefits of e way bill? 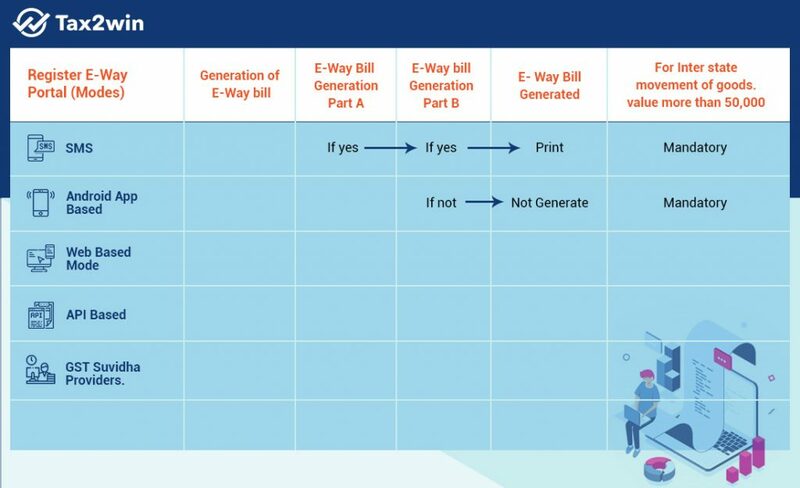 How does the e way bill mechanism works? What is the official or government website for generating E Way Bill? When e way bill is required to be generated? Is e-way bill required even when the consignment value is less than 50000? When e way bill is Not Required to be generated ? Which form needs to be filled for generation of e-way bill and by whom? What documents are required to generate e way bill? How to generate E Way Bill web portal? What is Bar Code in generated E way bill? How to cancel e-way bill? What is the Penalty for non-compliance of e-way bill? What is the Validation period of e way bill or consolidated e way bill? What is consolidated bill?Is e-way bill and consolidated e way bill are same or different? What is the meaning of E way bill ? 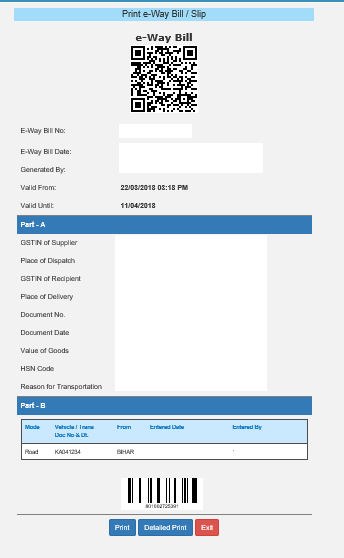 The full form of E-way bill means electronic way bill. E-way bill will be applicable to the movements of goods in both inter and intra State Transportation. To put it simply like the name suggests it is an electronic document generated from the e-way bill portal ewaybillgst.gov.in evidencing movement of goods. It is basically a compliance mechanism under GST wherein by way of a digital interface the person causing the movement of goods (consignor/seller) uploads the relevant information prior to the commencement of movement of goods and generates e way bill on the GST portal. As per the gst rules, every person registered under GST, who causes the movement of goods of consignment value more than Rs.50000, is required to furnish the details of the said goods in a specified form (e-way bill), before the commencement of such movement of goods. Under which section e-way bill is required? The Statutory requirement of e-way bill is covered under Section 68 of the CGST Act & Rule 138 of the CGST Rules, 2017. What is the date from which e-way bill has been made compulsory? The system of e-way bill has been made effective from 01.04.2018 for inter state movement of goods. E way bill on Intra-state movement of goods shall be done in a phased manner. What are the benefits of e way bill ? Facilitate faster movement of goods. Improve the turnaround time of trucks since the checkpost have been abolished.Thus, will benefit the logistics industry by reducing the travel time and cost as well as increasing the distance travelled. User friendly e way bill generating system. This means, there is no need to visit e way bill department for generation of e way bill as this was the major hardship in existing system. The e-way bill can be directly generated online. The entire system is online, thus avoiding tax evasion. How does the e-way bill mechanism works? Every person who falls under the e-way bill compliance, is required to first register on the common portal. Post that they can generate the e-way bill. Upon generation of the e way bill on the common portal, a unique e way bill number shall be made available to all the three parties,on the common portal i.e. After filing of Part A of form GST EWB-01, there is a mechanism on the common portal for the other party to see the e-way bill generated against his/her GSTIN. Now the other party is required to either give acceptance or rejection of such consignment specified in the e-way bill. Please note that, if the acceptance or rejection is not communicated within 72 hours from the time of generation of e-way Bill or the time of delivery of goods whichever is earlier, it will be deemed that he has accepted the details. Once the e way bill is generated you cannot edit the e way bill. However, Part B of e way bill in which the Vehicle number is mentioned, can be updated by the transporter. Updation is done in case he is sending goods with other vehicle or due to vehicle damage. E way bills can be generated and managed at https://ewaybillgst.gov.in/login.aspx. When e way bill is required to be generated ? shall furnish information relating to the said goods in Form GST EWB-01, before the commencement(start) of such movements. When e-way bill is required even when the consignment value is less than Rs 50,000? Where the goods are sent by principal located in one state to a job worker located in other states, the e-way bill shall be generated by the principal irrespective of the value of the consignment. Irrespective of the value of consignment e way bill shall be generated where, handicraft goods are transported. These people are otherwise exempt from taking registration u/s 24 of the CGST Act 2017. You can also read this notification in Hindi. When e way bill is Not Required to be generated? Where the goods are being transported by non-motorised conveyance like the goods transferred by animals carts. When goods transported for the clearance by customs from the custom port, airport, air cargo complex and land custom station to an inland container depot or container freight station. Where the goods mentioned in negative list are being transported. These include alcoholic liquor for home consumption, petroleum crude, high speed diesel, motor spirit known as petrol, natural gas or aviation turbine fuel. Through any mode- in his own conveyance or a hired one or by railways or by air or by vessel. Form GST EWB-01 has two parts – Part A & Part B. Part A of Form GST EWB-01 contains the information of invoices, supplier, receiver and items in invoice with HSN code and tax rates. Part B of Form GST EWB-01 contains the details of transporter like mode of transfer, approximate kilometers, Name, Transporter Id, date, vehicle number. Please note that e-way bill shall only be considered to be generated after furnishing information in Part B of form GST EWB-01. Under the e-way bill system, for registration on common portal there are different modes available.These are- . For all these modes, the user needs to first register on the web based system. What is the process for Registration on e-way bill portal through SMS? User needs to have the registered mobile number which he/she used for registration on the e way bill portal. Once the user selects option ‘for SMS’ under main option ‘Registration’, following screen is displayed. Then user needs to enter the OTP received on the registered mobile number and mail ID, verify the.details The system validates the OTP and directs the user to the following screen. Next, the user needs to select the User id from the drop down menu. The mobile number of the selected user will be auto populated by the system. Please Note: A taxpayer can register a maximum of 2 mobile numbers for the m-Waybill purpose. 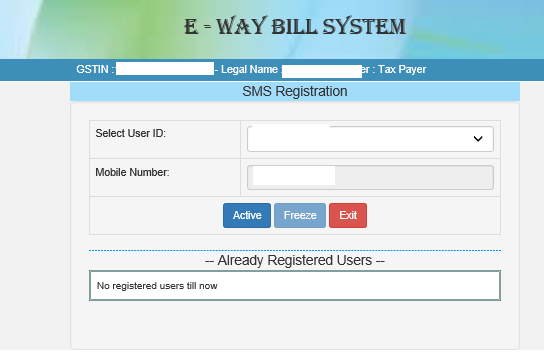 Once the user gives the submit request the particular user can generate e-Way Bill through SMS system. 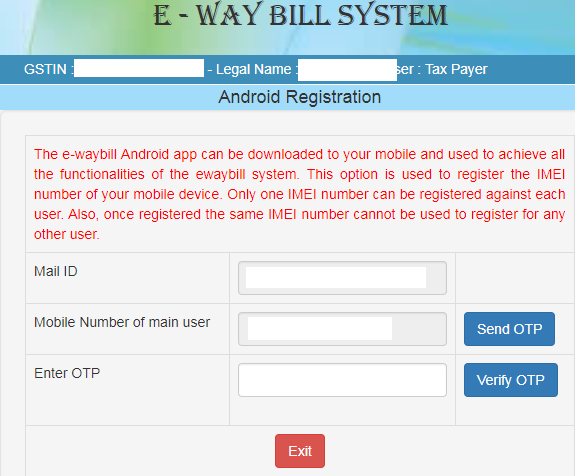 What is the process for Registration on e-way bill portal using Android app? The e way bill can also be generated through the mobile application directly. But for this system enables the user needs to first register on the common-portal with the android mobile details from which e-way bill shall be generated. Once a user selects ‘For Android’ under the ‘Registration Option’ , the following screen is shown. The user needs to select the user id from the drop down menu, name and place will be auto populated by the system. 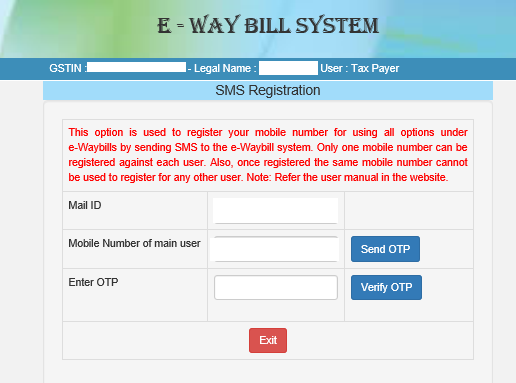 There is an option, to generate the e-way bill from the mobile application directly. For availing this facility the user needs to select “Yes” option under “Do you want to enable android app” option. Post this, you will be required to enter the IMEI number of the concerned user, who will be authorised to generate e-way will on your behalf. Then click on save details in the e-Way Bill system. Once saved, the authorised user will be able to generate e-Way Bill through android application. 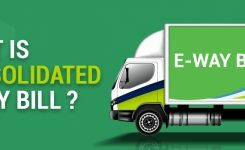 How to Register for e-way bill using web portal? How Registration is done by the Taxpayers on the e-Way Bill System? The registration mechanism for the GST taxpayers under the e-Way Bill system is a very simple process. It needs to be done only once. Enter the url https://ewaybill.nic.in/ in your browser. On the e-Way Bill portal, first time GSTIN can be registered by clicking on the ‘e-way bill Registration’ link under “Registration” option. The user needs to enter his/her GSTIN number along with the displayed captcha and shall click ‘Go’ to submit the request. Then, the user will be redirected to the ‘e-Way Bill Registration Form’. The registration form is shown below. 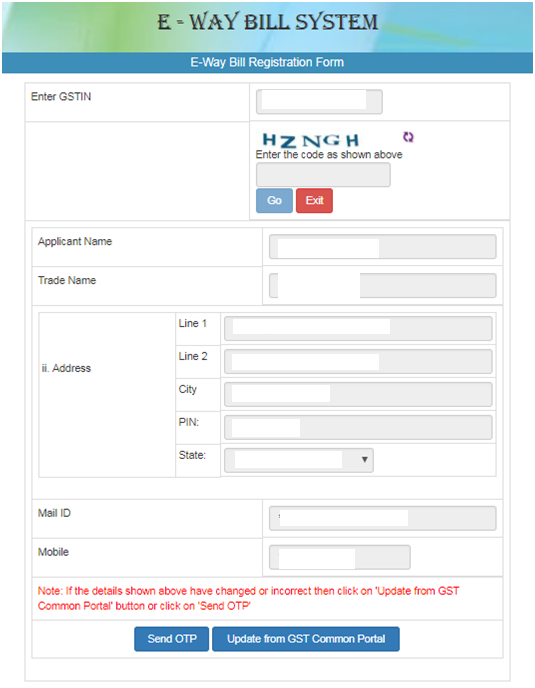 Which will have these auto populated details – Applicant name, Trade name, Address, Mail ID and Mobile Number. If the details have been changed or are incorrect, then click on ‘Update from GST Common Portal’ button to pull the latest data from the GST Common Portal. Else, click on ‘Send OTP’ to get the OTP. Once OTP is received on the registered mobile number, enter the OTP and click on ‘verify OTP’ to validate the same. Next, enter your choice of User ID or username, which you plan to use to operate account on this system. A Unique user name should be given. It should be about 8 to 15 alphanumeric characters and can include special characters as well. Once a request for the registration is submitted, the system validates the entered values. Pops up with the appropriate message for any error will be shown. Else, the username with password is created and registered with e-Way Bill System. You can now use this registered username and password to work on the system. What is the process of Registration for unregistered transporter on the e-Way Bill System? After verification of these details, the system generates 15 character Transporter ID and user credentials. Enter the url https://ewaybill.nic.in/ in your browser. Select the ‘Enrolment for Transporters’ option. After this the system will show up the following screen or form. Fill in the details as explained below to proceed. Select the State and enter the legal name as given in the PAN number and click of ‘Validate’ button. Enter the business details and contact details which includes the details of “Address”, “Email Address”, “Telephone Number” and “Nature of Premises”. Next, mention the Aadhar number details of the proprietor or main person of the company/firm. Upload the Address and ID proofs (PoA and PoI) by clicking on the respective ‘Upload’ buttons. Afterwards, enter the username and password that you like and wish to use for future login activities. Click on the checkbox to declare that the given information is correct to the best of your understanding. Click on the ‘Save’ button to complete the process. The system will now generate the 15 digits TRANS ID. This TRANS ID, can be provided by the transporter to his clients. Which would e used by client to fetch auto populated information in the e-way bill system. It will also enable the transporter to enter the vehicle number detalis for the generation of e-way bill. How to generate E- Way Bill through web portal? First we need to click on this link https://ewaybillgst.gov.in/ewb.html. A page as shown below will open up. Then we need to click on “E-way bill” option as given in the image below. When you are selling your goods to another person then you need to select the Outward option and if you are purchasing the goods, you can select the inward type. However, when you select the option of inward then there is a change in Sub type also. When goods are being transported for consideration in the course of furtherance of business. When goods are transported to another country. When goods are being sent to do job worker for further process. When goods are being sent in a dissemble form. When sale event depends upon the approval, in this case, the recipient is not known. When the goods are being transported for your own use. When goods are being sent for Exhibition. When products are carried in bulk to sale separately to different dealers like Pepsi Van selling bottles to small retailers. Tax invoice:- Registered dealers can select the option of Tax invoice because he is charging taxes in his invoice. Bill of Supply:- As per GST law Composition dealer can not charge taxes in his invoice so in this case he needs to issue bill of supply. Delivery Challan :- In case of job work, exhibition of fairs, own use or sales return there is no option available except delivery challan because there is no need to issue tax invoice in case of these category. Next, you are required to mention the “document number” and document date of respective documents which were selected in document type. Bill to ship to :- When you are billing to the other party and shipping the goods to other than billing party on behalf of the billing party. Bill from and ship from:- When you are billing from registered place and dispatch the goods from another place. Next, the details of place, from where we transferred the goods to the place these goods are delivered needs to be entered. Information such as Name, GSTN, State, Address, Place, Pincode needs to be mentioned. However, practically the details of seller, is already auto populated. If you are sending the goods to Unregistered dealer than you need to type in GSTN detail “URP”. After that we need to mention the details of items like product name, description, HSN, quantity, taxable value, tax rates etc. There is an option to add multiple products as well. After that we need to mention the detail of transporter like name, transporter id, approximate distance. However Transporter name and id is not mandatory fields but you have to mention the distance. Second select the vehicle type Regular and over dimensional cargo. Third we need to type the vehicle number. Fourth transporter document number if available and date. Click on preview to check that the details mentioned are correct or not. After verifying that all the details entered are correct, we need to click on submit to generate the challan. Congratulations, now the e-way is generated! What is Bar Code in the generated E way bill? This is one of the most useful feature for all GST e-way bill user. The feature helps transporter and department officers to scan and verify the authenticity of GST e way bill. 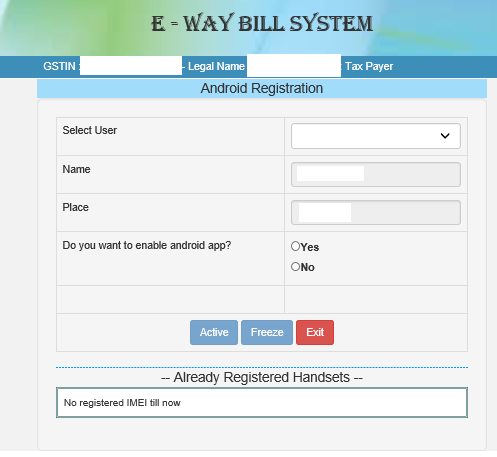 The e way bill number, User GSTN number mentioned on the bill, Date and time of creation of the e way bill. This can be used to match with the details printed to verify that there is no manipulation or modification in the printed copy. Where an e-Way bill has been generated under this Rule, but goods are either not transported or are not transported as per the details furnished in the e-way bill. The e-way bill can be cancelled within 24 hours of its generation. This can be done electronically on the common portal, either directly or through a Facilitation Centre notified by the commissioner. However, if the e-way has been verified in transit in accordance with the provisions of rule 138B, even before the expiry of 24 hours. Then, an e-way bill cannot be cancelled. How to cancel e-way bill in case of wrong information? Click on the E-way Bill Option>>>then click on the “Cancel” button on the dashboard. After this click on cancel. Next, enter the e-way bill number and click on the go.